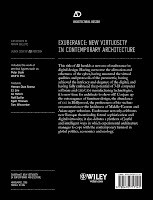 AD Exuberance: New Virtuosity in Contemporary Architecture (guest.ed Marjan Colletti). March/April 2010, Profile No 204. This title of AD heralds a new era of exuberance in digital design. Having overcome the alienation and otherness of the cyber, having mastered the virtual qualities and protocols of the parametric, having achieved the intricacy and elegance of the digital, and having fully embraced the potential of 3D computer software and CAD/CAM manufacturing technologies, it is now time for architects to show off! Conjure up the extravagance of furniture design, the abundance of CGI in Hollywood, the profuseness of bio-techno ornamentation or the lavishness of Middle-Eastern and Asian super-urbanism. 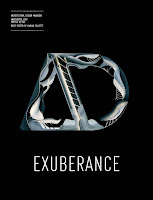 Exuberance not only celebrates new Baroque theatricality, formal sophistication and digital virtuosity; it also debates a plethora of joyful and intelligent ways in which experimental architecture manages to cope with the contemporary turmoil in global politics, economics and ecology. Features Hernan Diaz Alonso, Marjan Colletti, CJ Lim, Ali Rahim, Yael Reisner, Neil Spiller, Kjetil Thorsen and Tom Wiscombe. With contributions by Robert Harbison and Judith Clarke.